Here at FSB, we will cover the NFL in broad strokes. While this isn’t a 49ers site, it is most definitely, a 49ers “bar”, as we have been lifelong fans of the Red & Gold. The Niners made their debut in the shiny, new, expensive ($1.3B), and possibly cursed (see here, here, here and here) compound called Levi’s Stadium (we haven’t gotten used to the name yet) last Sunday for a preseason game vs the Broncos. As Candlestick Park had her lights shut off for good after a Paul McCartney concert last week, we wanted to look back at the top 10 games in our minds, ever played at The Stick. A quick look back through the record books makes you realize just how many incredible games were played at that stadium. On top of the games themselves, some major shifts in the NFL landscape occurred as a result of those games. Without further ado, our top 10 49ers games played at Candlestick Park. Honorable Mention #1: December 23, 2013 (MNF) – 49ers 34 Falcons 24: The final game at Candlestick, and what a send off. The Stick would host its 36th and final Monday Night Football game, an NFL record. We’re biased, but the 49ers were MNF for a long time in the NFL. Back before the Sunday night game became the match up of the week, MNF was where the NFL’s elite were showcased. ESPN has watered down the product, and the match ups are usually 2nd fiddle to the NBC Sunday night game these days, but one for one last Monday night, Candlestick had that old feel again. A rematch of the classic NFC Championship game from the previous January, Atlanta limped in with an extremely disappointing 4-10 record. The Niners had a tough time pulling away, but a late 10 point lead looked safe. After a Falcon touchdown and onside kick recovery (which Bill Bucker’d right through NaVarro Bowman’s legs), Atlanta was in business to pull off what would have been a loss for the home team. 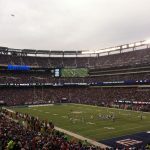 Playoff seeding was up in the air for the Niners, as well as sending raucous Monday night crowd out into the parking lots of The Stick with one last win. Surely Matt Ryan and underachieving Dirty Birds weren’t going to spoil the party, right? Right. With Atlanta in business, Ryan would have a pass tipped into the waiting hands of Bowman, who ran what seemed like 900 yards on this play after initially rushing the QB. 89 yards later, Bowman was in the Falcon end zone, mobbed by his team mates, after returning the pick in what will go down as one of the greatest plays in the stadiums history, as well as the final touch down. Honorable Mention #2: December 28, 1992 (MNF) – 49ers 24 Lions 6: A game that was meaningless in the standings, but had plenty of meaning for 49ers fans in the stands and watching on TV. The 13-2 Niners came in to this game with home field advantage secured, after Steve Young’s 2nd full season had been a rousing success. This game however, would mark the official end to the most talented QB controversies in NFL history. Joe Montana, having not played since January of 1991 due to injury and Young’s ascension, would get his farewell in front of an emotional Candlestick crowd. Coming out of the locker room with a 7-6 lead, Young would hand the reigns of the 49er offense to Montana for the last time. Joe looked as cool as ever, considering the circumstances. I guess you don’t win four Super Bowls by shrinking on the big stage. After two quarters of football, Montana nearly posted a clean sheet: 15 for 21 for 126 yards and 2 TDs. Montana would be traded to Kansas City the following April and would never play another professional game at Candlestick. Honorable Mention #3: December 17, 2000 – 49ers 17 Bears 0: Another sendoff for one of the greats. 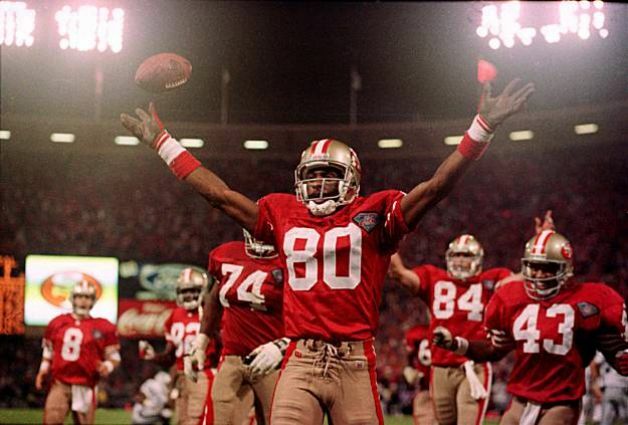 This time it was Jerry Rice, quite possibly the greatest player in NFL history. It was known this would be the last season Rice would play for the 49ers, with his expiring contract, diminished numbers and the emergence of a new, stud WR, Terrell Owens. The changing of the guard from Montana to Young was a years long tug of war that left coaches Bill Walsh and George Seifert constantly playing psychologist to keep both happy. With Rice and TO, there was less of an issue, given the simple fact both could be on the field at the same time. But as Rice put up back to back seasons of less than 1,000 yards, the Niners front office decided it would be time to move on after 15 seasons of the best WR to ever suit up. With Jeff Garcia now leading the offense, the Niners were on the verge of a couple of solid seasons. 2000 would not be one of them, as the team finished 6-10. In a final farewell to Rice, his protege would steal the show. In a performance that single-handedly won a lot of fantasy league championships, Owens went off for 20 grabs, 283 yards and 1 touch down. The reception total broke Tom Fears 50 year old record. Rice would be carried off the field and given one last standing O from the 49er faithful. 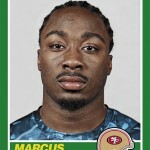 He would sign with the Raiders in the off season and have a couple more very productive seasons. As for TO…that’s another column all together. #10: January 5, 2003 – (NFC Wildcard) 49ers 39 Giants 38: When the 3rd largest comeback (24 points) in NFL playoff history clocks in at #10, you know you’ve got quite a list. Midway through the 3rd quarter of this game, Jeremy Shockey dropped a sure touch down and Big Blue would settle for the field goal, making it 38-14. They wouldn’t score again as Jeff Garcia and TO exploded, bringing the Niners all the way back to take a one point lead with one minute remaining. Kerry Collins would drive the Giants, but on a last second field goal attempt, long snapper Trey Junkin (who had just been brought out of retirement that week) would unleash his 2nd bad snap of the 2nd half, and the Giants wouldn’t even get the kick off. The way we remember it, nothing else controversial happened on that play. #9: November 13, 1994 – 49ers 21 Cowboys 14: We have a soft spot for the old regular season 4pm kickoffs with Madden and Summerall. The epitome of a big game (bigger than MNF to us, even back then). 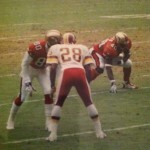 When FOX secured the rights to the NFC after the 1993 season, it was a match up like this they salivated over. Easily one of the most hyped regular season games of the past couple decades, the 8-1 Cowboys came to town to face the 7-2 49ers. Two of the most stacked rosters you could ever dream up had a standing reservation in that years NFC Championship Game, the only thing in doubt was where would it be played? Dallas had beaten San Francisco three consecutive games over ’92 and ’93, including the past two NFC Championship games. Another loss to the hated Cowboys would have cast serious doubt on whether or not Young was truly up to the challenge of being the quarterback of the 49ers, after Montana’s epic run. A back and forth game would turn on three Troy Aikman picks, including a red zone gaffe that ended up in the hands of Merton Hanks. A late Brent Jones touchdown iced it, and a collective sigh was released from the 49ers faithful around the country. Dallas was the only team that mattered to the 49ers at this point, and they had finally knocked them down on the canvas. #8: December 15, 1997 – (MNF) 49ers 34 Broncos 17: I remember flying back from New York City with my father the first Sunday of ’97 season. We flew up to see a Yankee Saturday matinee versus the Expos (Pedro Martinez/David Wells!) and we landed back home on Sunday evening. In those days, I was NOT missing a football Sunday. But, my father really wanted to go see Yankee Stadium, as did I. It wasn’t really that big of a deal, because the 49ers had a pretty innocuous week 1 game at the Bucs, a laughing stock at the time. The Niners learned the days of the “Yucks” were about to be over, and as I sat down to watch Chris Berman lead off NFL Primetime with the updates from the late games, I couldn’t believe my eyes and ears. Final score. Bucs 13 Niners 6. Did the season end on week 1 while I was 30,000 feet in the air? Young would return after suffering a concussion, but Rice had his knee torn to shreds by Warren Sapp on an end around play gone horribly wrong. The Niners would feast on the soft NFC West and not lose another game until a wood shed beating at Arrowhead to the Chiefs. Soon after the beat down in KC, came the MNF Denver game, where Rice would improbably return after being declared out for the year and Joe Montana was to have his number retired. Hollywood movie stuff. The Rice return was nothing short of improbable, given that torn ACL/MCL injuries were potentially career ending in the late 90’s . No one had ever returned from such an injury as quickly as he did. By all accounts, Rice was borderline psychotic when it came to practicing and strength/endurance training. This return was a testament to an NFL career done the right way. John Elway came into town with a team that would end up winning the next two Super Bowls. But on this night, a back and forth 1st half, capped off by a Rice TD catch would evolve into a 2nd half avalanche, as the Niners cashed in two defensive TDs. Sadly, Rice would leave the game on his TD catch with a broken knee cap, and miss the rest of the season. Pound for pound one of the toughest players in league history, he would go on to put up several move productive seasons. 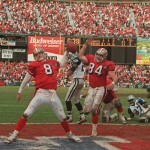 #7: September 7, 1994 – (MNF) 49ers 44 Raiders 14: Another magical Monday night. Speaking of Rice going about his business as an NFL player the right way, this night provided the ultimate payoff. On a 4th quarter 38 yard pass from Steve Young, Jerry Rice broke Jim Brown’s seemingly unattainable record for most touchdowns (126) scored in an NFL career. Rice scored three touchdowns this night, on a night where everyone in America who knew football, knew that record was going down. Monday Night Football, that’s all Rice needed. If he would have needed eight touchdowns that night he would have gotten it done. The Raiders became the victims of a 49er coronation, as the game stopped for what seemed like 30 minutes as Rice and the team celebrated in the stands with Jerry and his family. Heady stuff. Rice would end his career with 208 touchdowns. 197 receiving, 10 rushing and 1 fumble recovery. #6: January 12, 2013 – (NFC Divisional) 49ers 45 Packers 31: The first of two entries from the Jim Harbaugh era. This would be the coming out party for Colin Kaepernick as well as the final playoff game ever played at Candlestick. The story of this game begins and ends with Kaepernick. 263 yard passing with a pair of touchdowns paired with 16 rushes for a blistering 181 yards and 2 rushing touchdowns. The performance sent shock waves through the league, as Kaepernick tortured the Packer defense via the read option. Was this the future of football playing out right before our eyes? The read option has not gone the way of the Wildcat offense, but as is usually the case in the NFL, defensive coordinators have adjusted. Still, Kaepernick’s performance was jaw dropping as he spearheaded an offense that racked up 579 yards, a franchise playoff record. The game itself was actually closer than the final score. The fast break 1st half was offensive football being played at a very level, with Aaron Rodgers and Kaepernick trading blows, while the defenses tried to keep up. A muffed punt by Green Bay in the 2nd quarter gave the Niners new life, as they cashed in the turnover for 7 points on a big 3rd and 12 TD pass to Michael Crabtree. The 2nd half would turn on an electric 56 yard TD run that the Packers wouldn’t recover from that night. Frank Gore did Frank Gore things, with 119 yards on the ground and the Niners took over the line of scrimmage in the 4th quarter to blow the game open and leave one final playoff memory on the turf at Candlestick. The fact that the opponent this night was the old thorn-in-the-side Green Bay Packers made it extra sweet. Part Two can be seen here.